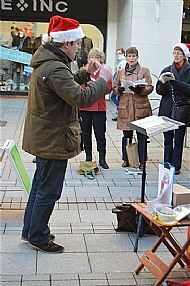 Each of the images below represents a performance, or other event such as a tour, of King's Lynn Festival Chorus. Click on an image to reveal additional images from that performance or event. 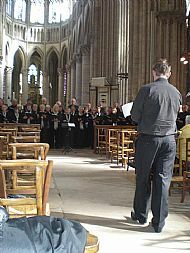 Based in Caen, we sang in Rouen and Bayeux. 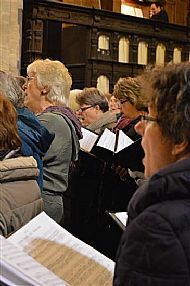 This was our first choir tour with Tom and we were based in Ghent and Bruges. For most of us, the most memorable event was being permitted to sing in the Menin Gate during the Last Post Ceremony. Although early in the year, the thermal spring pool at our hotel was beautifully warm. Much travelling meant we didn't have a lot of time to enjoy it though. We visited Umbria, Le Marche and Tuscany, singing in churches and a school and, most memorably, in the Basilica in Assisi. Based in Cordoba, our first tour included a memorable concert in the Mezquita and a visit to Granada.